"I think we just decided that that one kind of sums up the whole album," Tyler told CountryLiving.com. "This album is definitely more country than our previous albums—kind of taking it back to the '90s country that BK and I grew up on. It just kind of summed it up and made sense, so we just rolled with it." 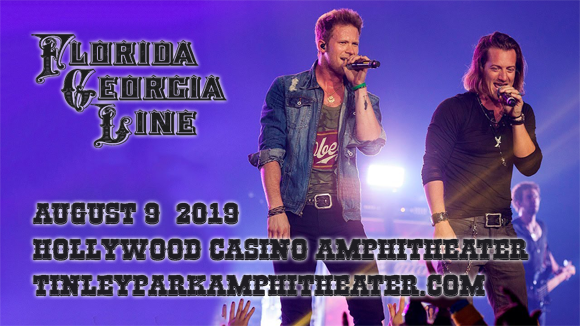 They'll be joined by special guests Dan and Shay & Morgan Wallen! Formed in Nashville, Tennessee in 2010, Florida Georgia Line are an American country music duo. Both vocalists and guitarists, Tyler Hubbard and Brian Kelley met in college and began performing together as a covers band in 2010. They released their original debut single, "Cruise", in 2012. The single was downloaded over seven million times, making it the first country song ever to receive Diamond certification from the RIAA, and it charted at number one for 24 weeks, making it the best-selling digital country song of all time until 2017, when Sam Hunt's "Body Like a Back Road" took the title. The duo's music laid the groundwork for the bro-country genre, with its hip hop and rock influenced and upbeat lyrical content. The duo's fourth studio album, Can't Say I Ain't Country, was released in February 2019. Previously known as First Midwest Bank Amphitheatre.